Khurshid Mahmud Kasuri, the Foreign Minister of Pakistan from 2002 till 2007,was recently in the news (while in India) for the launch of his book Neither a Hawk nor a Dove: An Insider’s Account of Pakistan’s Foreign Policy. This had less to do with the contents of the publication, and more with extraneous circumstances. 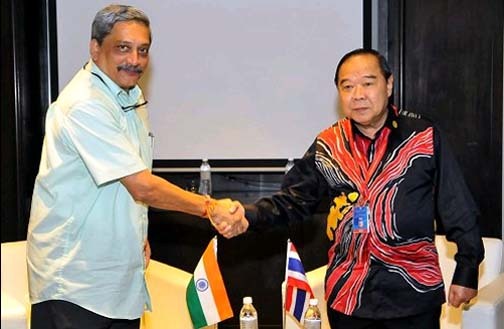 The Defence Minister Manohar Parrikar today expressed India’s hope that all parties to the disputes in the South China Sea region will abide by the 2002 Declaration on the Conduct of Parties in the South China Sea, ensure its effective implementation and work together to ensure a peaceful resolution of disputes. Addressing the 3rd ASEAN Defence Ministers’ Meeting (ADMM-plus) at Kuala Lumpur Manohar Parrikar said the situation in the South China Sea and recent developments there have attracted interest and concern. “This is natural since freedom of navigation in international waters, the right of passage and overflight, unimpeded commerce and access to resources in accordance with recognized principles of international law including the 1982 UN Convention on the Law of the Sea, are of concern to all of us”, he stated. He also hoped that the Code of Conduct on the South China Sea would be concluded at an early date by consensus. Indian External Affairs Minister (EAM) Sushma Swaraj had a stopover in Ashgabat, the capital of Turkmenistan, on October 19, 2015 while on her way to Moscow, where she co-chaired the annual India-Russia Inter-Governmental Commission. 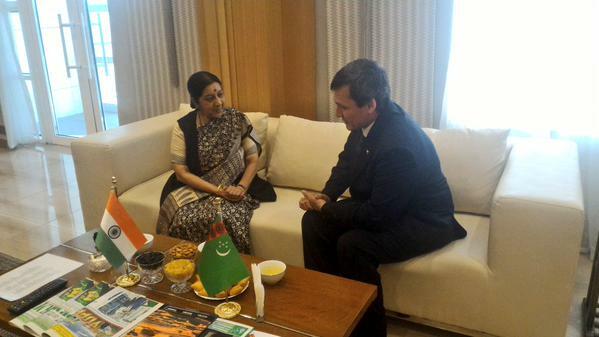 This was EAM’s second visit in last six months to Ashgabat; a period which also saw Prime Minister Modi’s visit to Turkmenistan in July. The common issues that came up during the discussions held by both the Indian leaders with their respective counter-parts were TAPI gas pipeline and Ashgabat Agreement on trade and transit. The first matter concerns India’s energy security while the second pertains to regional connectivity. An agreement between five countries on establishing a new international transport and transit corridor (Uzbekistan – Turkmenistan – Iran – Oman– Qatar) was signed on 25 April, 2011 in Ashgabat. This agreement, known as “Ashgabat Agreement”, forms the basis for developing the shortest trade route/corridor between the Central Asian countries and Iranian and Omani ports. Nepal police on 2nd Nov opened fire killing a 19-year-old student from Darbhanga in Bihar. The police opened fire near the border to stop Madhesi protesters from reoccupying a bridge in the No-Man’s Land demarcating the Raxaul-Birgunj border between India and Nepal. Security forces dominated by those from the hilly regions, have brutally suppressed these demonstrations. The political elites have deliberately ignored their demands something that has not been hidden from any one. Ethnic minorities have taken to the streets in large-scale protests against the discriminatory provisions of the new governing order. Nepal’s new constitution is highly controversial further deepening the divide. When Chinese President Xi Jinping went to Pakistan on an official visit in April 2015, he brought with him a $46 billion gift that potentially could have very significant benefits for that country, as well as have a major impact on the region. And although there remain a number of unknowns on how this massive Chinese investment package will be implemented over the next 15 years or so, it is certain that it will pull Pakistan even deeper into Beijing’s geostrategic orbit. Even though China and Pakistan have had a long and fruitful relationship for well over 50 years, if all the projects associated with this deal are ultimately implemented, it will be a game-changer for the region—equal to all the foreign direct investment inflows into Pakistan since 1970 combined and dwarfing the $7.5 billion US aid package passed by Congress in 2009. With the decision to conduct a Freedom of Navigation operation (FONOP) in the waters around China’s artificial islands in the South China Sea, U.S.-Chinese relations appear set to deteriorate in the coming year. 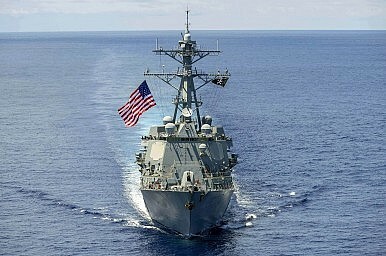 Given the likely rise in tensions, especially if the United States conducts additional FONOPS, it is essential that U.S. leaders understand the Chinese perspective, even as they must make clear to Beijing (and others) that they are firmly committed to the principle of freedom of the seas. Some have attempted to explain China’s approach by comparing it to theMonroe Doctrine. China, they say, is intent on asserting a sphere of influence, in which its interests are accorded primacy. One week ago today, the U.S. sent a destroyer within 12 nautical miles of the Chinese-controlled Subi Reef in the South China Sea on a freedom of navigation patrol. Two days later, on October 29, the Permanent Court of Arbitration in The Hague ruled that it does have jurisdiction to hear the Philippines’ case challenging China’s “nine-dash line” in the South China Sea. In other words, it’s been a big week for the South China Sea disputes. Discussions of the South China Sea tend to center around China – its “aggression” or “assertiveness”; theambiguity of its claims; its moves to overturn the “status quo” or create “facts on the water” by building artificial islands. But China isn’t alone in claiming wide swathes of the South China Sea based on “historical” claims that seem out-of-step with UNCLOS. In fact, Taiwan – a close U.S. partner and generally seen as an upstanding supporter of international law – has claims almost identical to Beijing’s, a function of the fact that the Republic of China government was the originator of China’s claim to the u-shaped line encircling most of the South China Sea. Over at The Washington Free Beacon Bill Gertz has the scoop that a Chinese submarine shadowed a U.S. nuclear super-carrier, the USS Ronald Reagan, in what Pentagon officials called the closest encounter between a People’s Liberation Army Navy boat and an American aircraft carrier since 2006. According to Gertz, the incident occurred on October 24 as the USS Ronald Reagan was on its way from Yokosuka Naval Base in Japan’s Kanagawa Prefecture, sailing around the southern end of Japan to the Sea of Japan. 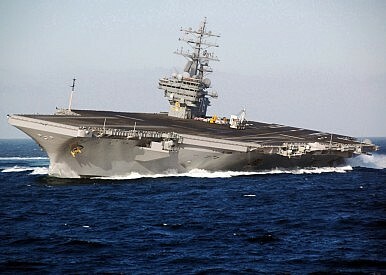 The USS Ronald Reagan is currently the U.S. Navy’s only forward-deployed aircraft carrier in the Asia-Pacific. Other vessels present during the incident were the guided missile cruiser USS Chancellorsville and the guided-missile destroyers USS Mustin, USS Fitzgerald, and USS Curtis Wilbur. “Pacific Fleet and Pacific Command spokesmen declined to comment on the submarine encounter but did not deny that the incident occurred,” Gertz reports. 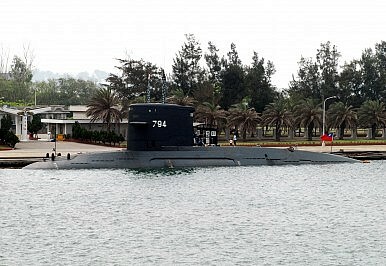 The Pentagon also refused to reveal the exact nature of the encounter and what type of submarine was involved. A meeting of Asian defense ministers has failed to issue a joint declaration as scheduled for the first time after China lobbied to block mention of its assertiveness in the South China Sea, media outlets reported citing a U.S. defense official. “Our understanding is there will be no joint declaration,” the official said, speaking on condition of anonymity according to Channel NewsAsia, a Singapore-based media outlet. 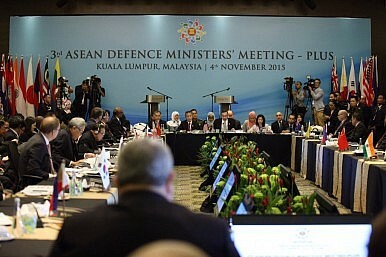 He was referring to the joint communique usually issued at the biannual ASEAN Defense Ministers Plus (ADMM-Plus) meeting, which saw its third iteration held in Kuala Lumpur, Malaysia this week. The ADMM-Plus groups the 10 countries of Southeast Asia and eight other countries – Australia, China, India, Japan, South Korea, New Zealand, Russia and the United States. Malaysia is hosting the meeting this year as the holder of the rotating ASEAN chair. According to the U.S. official, China opposed mention of its construction of artificial islands in the South China Sea in the joint statement, but “a number of ASEAN countries felt that (it) was inappropriate” to exclude any mention of it in the official statement. Over the course of the last several years, tension in the western Pacific has been building. Naval buildups and military modernization efforts continue apace, despite economic downturns. Deployment of ships and new aggressive actions by surface fleets continue unabated. Most recently, plans to spend billions of dollars building up islands that are far from the continental territory have been put into motion. And those are just the actions by the United States. For its part, China has been acting more assertively as well. 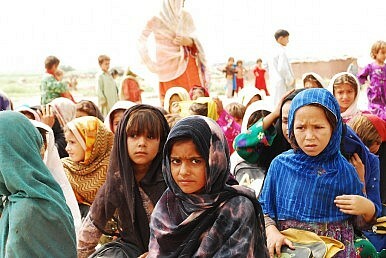 Although it is certainly not the sole instigator in the region, it is by far the largest. Since 2010, which not coincidentally coincides with the start of historically high oil prices, China has continued to adopt more assertive positions and actions when it comes to enforcing its claims in the South China Sea. Over the course of the past year, China, as well as Vietnam and the Philippines (a U.S. treaty ally), has undertaken a series of projects to build and expand its claimed territories in the region. This has been the subject of much reporting and hype, and has elicited multiple calls from the U.S. and others for all parties to halt the build-up of these areas. The most recent development is that the U.S. Navy sailed a military ship, a destroyer, within 12 nautical miles of one of the ‘features,’ aka shoal of rocks, in the region, thus touching off another round of escalating tensions. EIN EISSA, Syria — Weeks after the Obama administration canceled a failed Pentagon program to train and arm Syrian rebels to combat the Islamic State, American officials announced a new effort to equip newly named ground forces inSyria to fight the jihadists. But 10 days of interviews and front-line visits across northern Syria with many of the forces in the alliance made clear that so far it exists in name only, and that the political and logistical challenges it faces are daunting. There seems to be a perception in the West that the war against the Islamic State of Iraq and the Levant (ISIL) isstalemated on the main battlefields of Iraq and Syria. That’s probably true in northwestern and central Syria, where ISIL and the Russian- and Iranian-backed Assad regime are containing and eroding progress by rebel forces. By contrast, there has been a mixture of frustrations and solid achievements in Iraq and eastern Syria. ISIL still holds Mosul, Raqqa, Ramadi and a number of other major Iraqi and Syrian towns. But Baghdad, Erbil, Samarra, Kirkuk and Haditha were denied to the enemy. And Mosul Dam, Jurf as-Sakr, Kobane, Tikrit, Tal Abyad and Bayji were recaptured alongside scores of less well-known settlements. Russia’s air campaign in Syria has demonstrated that the Voyenno-Vozdushnye Sily has made great strides toward recovery since its near collapse in the mid-1990s. However, while the Russian air force is receiving much needed new hardware, the service’s modernization plans could create some challenges in the years to come. Instead of standardizing on two or three common airframes, Russia is buying an eclectic mix of jets including Sukhoi Su-30M2, Su-30SM, Su-35S Flankers and the Su-34 Fullback. In addition to those four types, Russia has also ordered modernized MiG-29SMT and MiG-35 Fulcrum-F fighters. It’s also planning on buying new-build Tu-160M2 Blackjack strategic bombers. Meanwhile, the Russian Navy is hoping to buy twenty or so MiG-29K Fulcrums to replace its ageing Su-33K Flankers in addition to its own shore-based Su-30SMs. While those orders keep Moscow’s aircraft production lines going, it also massively complicates Russia’s logistics. That’s because while those aircraft are based on two types of airframes, the different individual variants don’t have a lot of commonality. The chief technology officer of the Air Force said the plan to provide a consistent IT framework across the entire Pentagon “has been picking up steam,” as budgeted dollars have decreased and tech budgets in general have come under more scrutiny. “We can’t afford any longer to not have development standards for applications,” Air Force CTO Frank Konieczny said Monday at theDefense One Summit in Washington, D.C. The Joint Information Environment, or JIE, is a nebulous term that often “means different things to different people, depending on the mission,” according to Brig. Gen. Dennis Crall, chief information officer of the Marine Corps. Yet, it’s clear JIE is becoming more important to the Pentagon and military branches as they deal with constricted budgets and a top-down push to share data, applications and services that formerly would have been siloed away by each department. At the Air Force, Konieczny has gotten ahead of the JIE curve, promoting “as-a-service” methodologies, consolidated IT centers and more agile approaches to IT development, he said. When available, the Air Force is reaching out to commercial providers for tech needs, instead of building them in-house. 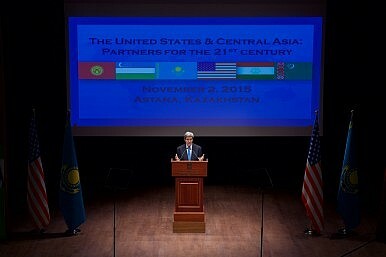 Tuesday at Nazarbayev University in Astana, U.S. Secretary of State John Kerry articulated the United States’ vision for its relationship with Central Asia. While he specifically said that “America’s stake in Central Asia … extends far beyond security,” his depiction of the relationship circled around security nonetheless. He identified three challenges which the U.S. and Central Asia must face together: economics, environment and energy, and combatting international terrorism. After making a few not-quite-accurate comments (I get to that below the fold) and complementing the host university, Kerry tried to connected the dots between the U.S. and Central Asia, from stability to prosperity via good governance. U.S. Secretary of Defense Ashton Carter is on a Pacific tour. Last week, Carter visited Alaska, where he emphasized the state’s importance to the United States’ Asia and Arctic policies. Three days ago, Carter flew to South Korea for talks with his local counterpart, Han Min-Koo. 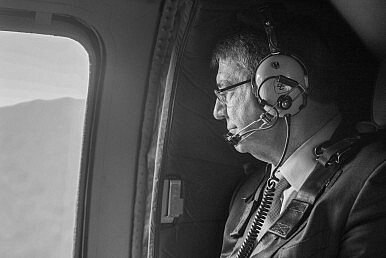 Yesterday, he continued to Malaysia to participate in the ASEAN Defense Ministers-plus (ADMM+) meeting. The topics discussed between Carter and Han were unsurprisingly focused on North Korea, and included Pyongyang’s nuclear, conventional, and cyber capabilities. Both ministers reaffirmed their commitment to a denuclearized peninsula, adding that the policy of “zero tolerance” towards future nuclear tests or long-range missile launches is still very much in effect. They specifically voiced “grave concern” over strong hints from North Korea that it is preparing a long-range rocket launch in violation of U.S. resolutions. Although the United States leads the world in technology innovation, it may fall behind if the government does not address emerging gaps in innovation policy and invest more in scientific research, argues a new progress report and scorecard from the Council on Foreign Relations' (CFR) Renewing America initiative. The report is authored by Renewing America Associate Director Rebecca Strauss and CFR Bernard L. Schwartz Senior Fellow and Renewing America Director Edward Alden. At 2.8 percent of gross domestic product, the United States as a whole spends more on research and development (R&D) than other countries, but major Asian economies—including Korea, Taiwan, and Japan—have ramped up R&D spending, and are graduating more scientists and engineers than ever before. According to the report, by about 2020, China is projected to surpass the United States as the world's largest R&D spender. Transforming an idea into an invention often takes years of scientific research, but businesses—currently accounting for two-thirds of R&D funding—have generally favored projects with shorter time-horizons and greater profitability over long-term research. At the same time, public universities, which conduct a majority of the country's scientific research, have struggled under unprecedented financial pressure. Without the incentives or resources to carry out high-risk but potentially high-impact research, scientists and academics are not as likely to produce transformative discoveries. Today, there is a large generational divide in the military. While our younger Soldiers and leaders were raised on Facebook, Instagram, and other social media platforms, our senior leadership was not. Many senior military leaders struggle with understanding this medium of communication that comes with its own language, culture, and norms. When they were company commanders, they did not have to worry about a misstep at the company level being posted on Army WTF Moments. They did not have to worry about maintaining a unit level Facebook page. They did not have to worry about someone “tweeting” away their position in war. The digital age has brought with it, it’s own set of leadership challenges. I hope to help bridge this gap, by providing leaders with a professional reading list of books, articles/blogs, and podcasts. While there are several dangers lurking on the social media landscape, there are also benefits with huge payouts in the domains of professional development and warfare. The list below is not all-inclusive, however it’s a start. If I’ve left something off this list, please include it in the comments section below. Also, if you have any questions please feel free to email me (my contact info can be found on the About Me page). Joe Byerly has served as a Cavalry platoon leader in a Stryker Brigade Combat Team and a Troop and Headquarters Company Commander in an Armored Brigade Combat Team. He also served as an instructor at the School of Reconnaissance and Security. He is currently a student at the U.S. Naval War College. He was a 2011 recipient of the General Douglas MacArthur Leadership Award. 1) What made you decide to open an account on Twitter? It isn’t uncommon for U.S. intelligence analysts to ping several hundred or more databases separately to collect information. That may soon change. The Joint Information Environment, orJIE, is a nebulous term that often “means different things to different people, depending on the mission,” according to Brig. Gen. Dennis Crall, chief information officer of the Marine Corps. Poker doesn’t immediately make you think of geopolitics. However, the game itself, specifically No-Limit Texas Hold ’em, is a remarkable analog for the international system as viewed through a realist lens. Not only is the construct of the game eerily similar to the geopolitical environment of today, but many of the strategies and choices in the game mirror those available to powers within the international system. Accordingly a more detailed examination of the game yields valuable insights into the affairs of nations in an anarchic world order. It’s time for future leaders to play poker instead of chess. The rules of No-Limit Texas Hold ’em are simple. Each player is dealt two cards. Five community cards are shared and are turned over in an initial batch of three, then one, and then the final card. Bets are made before each batch of community cards is revealed, and then one more time after the final card is turned over (four total bets). Players can bet up to and including all their money at any point (hence “No-Limit”). A player wins either by holding the best hand when all betting is over, or by playing in such a manner as to convince all other players to fold (give up) his or her cards. Regardless of who has the best hand, if only one player remains in the hand he or she wins it. This means that while luck can greatly impact the outcome of a single hand, over the longer term skill, understanding odds, reading other players, and selecting the right strategies will win out. Once the game starts, no additional money can be added (this is not always the case in all Texas Hold ’em games but should be assumed here). Leaders who know what to look for can take steps to prevent toxic leadership habits from infecting their command. Yet, looking out across Army formations, not much has changed. Toxicity continues and soldiers are smothered within commands that ultimately destroy their morale and willingness to serve, or worse, teach young impressionable leaders that “this” is how to lead. For leaders and future leaders, it’s important to recognize what a toxic command climate looks like. Just as important is to recognize the symptoms in order to understand that what they might be experiencing is not how a command climate should be. Leaders, current and future, who know what to look for can take steps to limit it or at least ensure that they don’t fall into the trap and promulgate the disease. 1. Micromanagement exists often on an epic scale. When it comes to national security, should one advise President Barack Obama on the best course of action or just the best course of action that he is likely or able to accept and implement? Military leaders offer their expertise and advice candidly to appropriate civilian leadership . . . Army professionals properly confine their advisory role to the policymaking process and do not engage publically in policy advocacy or dissent. Army professionals adhere to a strict ethic of political nonpartisanship in the execution of their duty. by Jeffrey W. Reaves Jr. Since the refinement of rotary wing operations, helicopters have become an integral part of unified land operations in conventional forces. Helicopters are now faster and more lethal due to progressive research and development competition between the U.S. and Russia. One byproduct of these upgrades, however, is that Man Portable Air Defense Systems (MANPADS) and other air defense weapons have increased in target acquisition ability and lethality. Newer generations of MANPADS can defeat automated countermeasures and move at higher speeds with more explosive power. Electronic systems and training programs can counter the technological imbalance between aircraft and anti-aircraft weapons. Training must also take into consideration the planning process and the effects on operations by the presence of MANPADS in an area of operations. Deputy Defense Secretary Robert Work at the Defense One Summit in Washington, D.C., Nov. 2, 2015. The resurgence of Russia and the continued rise of China have created a new period of great-power rivalry — and a corresponding need for a solid grand strategy, U.S. Deputy Defense Secretary Robert Work said Monday at the Defense One Summit in Washington, D.C.